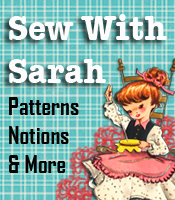 Darts are one of the most basic structural elements in dressmaking. They are used to build, into a flat piece of fabric, a definite shape that will allow the fabric to conform to a particular body contour or curve. Darts occur most often at the bust, back, waist and hips. It is very important to the fit of the finished garment that the marking and sewing of the darts is accurate. The stitching direction on darts is from the wide end of the dart to the point. Knot the thread ends at the point to secure the stitching. Backstitching can be used as a reinforcement at the wide end, but should not be used at the point. There are certain steps to follow when making darts, regardless of where the darts are on the garment, as outlined below. Before removing the paper pattern (A), transfer the markings to the wrong side of the fabric. 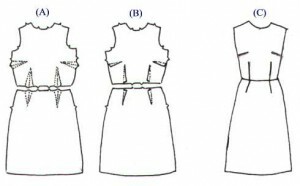 Tailors tacks are shown above, but other methods can be used as well. As you are making the knot at the point of the dart (D), don’t pull the threads too tight or it will pull the fabric at the dart point. The easiest way to ensure you get the knot right at the point is to place a pin at the dart point as indicated above, then tighten the knot letting the pin guide it to the dart point. After sewing, always press the darts for a smooth look on the garment. Press toward the point (E), being careful not to go beyond the point as it could crease the garment. Finally, place the dart, wrong side up, over a tailor’s ham and press it according to the direction it will take in the finished garment (F), being careful not to crease the rest of the garment. The pattern instructions will tell you the direction the darts should be made, such as “pressing the bust darts down”, etc. 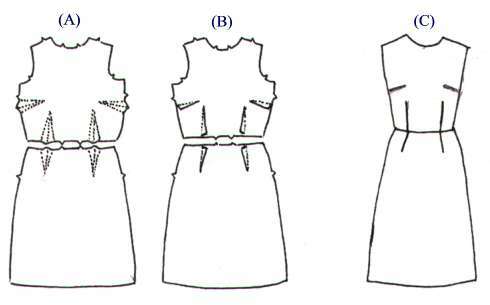 The illustrations shown above show the opened dart as it has been marked on the fabric (A), then the wrong side of the fabric showing the sewn dart (B), and finally, the right side of the dress with the darts in their proper position (C). After stitching, the darts should be pressed in a particular direction. The general rule is to press vertical darts toward the center front or center back, and horizontal darts downward. A finished dart should point toward the fullest part of the body contour to which it is conforming.